THE WEIGHTLESSNESS AND ISOLATION OF BLUE-WATER DIVING, where neither the bottom, a boat overhead nor any natural feature is visible in any direction, has been compared to a mission to outer space. The bottom is out of sight and there are no visible references anywhere. A similar sensation, although quite different, is experienced in zerovisibility conditions. Here the isolation and lack of references are caused by poor visibility instead of seemingly endless clear water. A blue-water adventure is an exhilarating experience for most divers, whereas, at least for me, zero visibility is more like survival training. Blue-water diving can be disorienting, especially for those experiencing it for the first time. With nothing but water in any direction, your only reference is the surface, which you typically can identify because it is lighter and your bubbles rise in that direction. In blue water it is difficult to even guess your position in the water column without consulting your depth gauge. Blue water means deep water, usually open ocean. Many divers assume that there would be nothing to see when the bottom is out of sight and there are no references, but that is not the case. Blue water is filled with all sorts of strange and wonderful creatures, such as iridescent comb jellies, long filamentous plankton, larval forms of corals and sponges. Blue water also is where the pelagics hang out. Pelagics are much different from the reef fish encountered on a typical warm-water recreational dive. They are larger and surprisingly inquisitive when they discover a strange object, like you riding the anchor, hanging out in their territory. While drifting in blue water I have been blessed with sighting manta rays, whale sharks, humpback whales, billfish and open-water sharks, just to name a few. 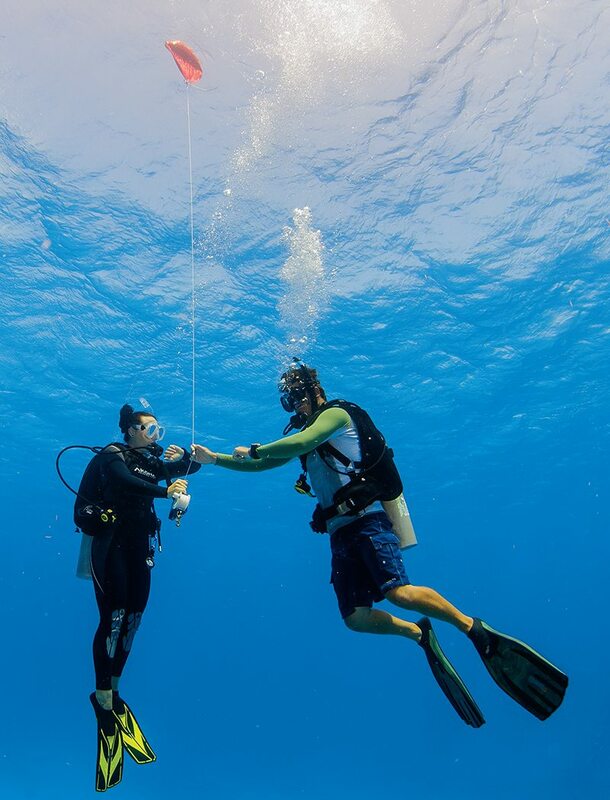 Not many divers ever have the opportunity to ride an anchor in blue water; however, drift diving along a deep wall, which is common at many tropical dive venues, often provides a blue water opportunity of its own. At the end of the drift dive the divers move away from the wall, completely out of sight of it, if they want to experience the blue water sensation, and perform the safety stop while gazing into water much too deep to explore on scuba. In some locations reaching blue water may not require swimming away from the wall at all. As you ascend from a drift dive along a wall, it is not unusual to encounter current that carries you seaward, toward deeper water. Unless instructed otherwise by the boat crew, go with the current; this is an opportunity to experience the blue water sensation. Keep in mind, however, that once the wall is out of sight and there is no visible bottom you may begin feeling a bit uneasy and even experience a twinge of disorientation. The absence of references makes knowing where you are in the water column difficult. In blue water you must carefully monitor your depth and control buoyancy to avoid sinking too deep or unintentionally floating to the surface. Without a boat overhead, unless you pay close attention, maintaining safety-stop depth can be a challenge. One tool that makes blue water safety stops easier is the lift bag. Deploying a lift bag helps you maintain a constant depth throughout the safety stop. The bag and associated tether line serve as a depth reference so you don’t have to continually check your depth and fidget with your inflator control. Instead, you can enjoy the safety stop by concentrating on scanning the endless blue water that surrounds you while resting on the tether line. The deployed lift bag floating on the surface above you also serves as a marker buoy that aids the boat crew in identifying your exact location. With the lift bag/marker buoy in sight, the crew knows that you are enjoying yourself while waiting to be plucked from the water. Any type of inflatable surface signaling device can be used as a reference when performing a safety stop in blue water. 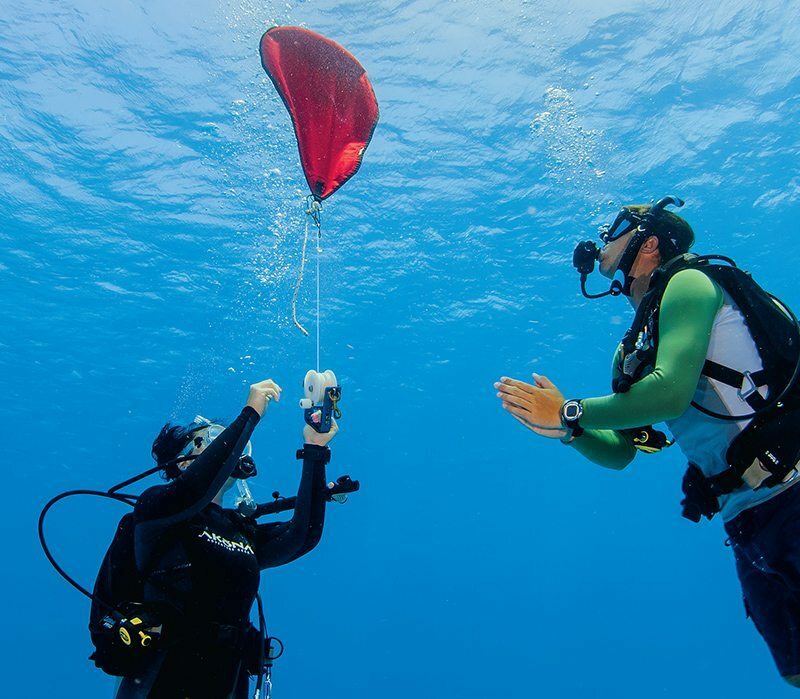 However, a lift bag provides significant positive buoyancy, which may allow you to actually hang slightly negatively buoyant on the tether line to maintain the proper depth. This eliminates the need to remain perfectly neutral during the stop. The only downside to using a lift bag is its deflated size. 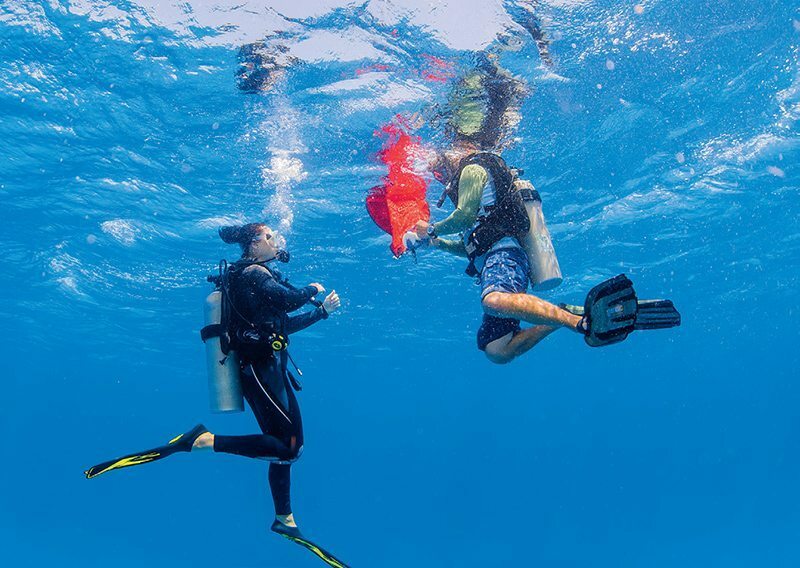 Whatever inflatable device you plan to use during your blue water stop, along with a reel for controlling the tether line, must be carried on your person throughout the dive. The bulkier the accessories you carry, the greater the drag as you move through the water; this could result in increased air consumption. To minimize drag, tightly roll the lift bag and secure it to the reel before clipping both to a D-ring on your buoyancy compensator. Attach the bag to the reel before entering the water to avoid the potential struggle to join the two while at depth (Photo 1 – scroll down for photos). The goal is to have the equipment you need, while keeping your profile streamlined. When you are ready to ascend to safety-stop depth, disconnect the reel from your BC, unroll the bag and inflate it just enough to make it slightly positively buoyant (Photo 2). Release the tether line slowly, especially as the bag nears the surface (Photo 3). If it breaks the surface too rapidly, the bag may flop over and deflate. With the bag fully deployed and buoyant on the surface, reel in any excess line as you ascend to the desired safetystop depth. Set the reel, as the tether line should remain taut throughout the safety stop. Establish neutral to slightly negative buoyancy to maintain a slight downward pull on the line. As you hang beneath the lift bag floating on the surface, relax and scan the blue water, regularly checking your air supply and safety-stop time; your depth should remain constant (Photo 4). When the safety stop is complete and it is time to make the final ascent, reel in excess line as you slowly surface. On the surface do not allow the bag to deflate until you have been sighted by the boat crew. Once you have had positive communication with the crew and the boat is underway to pick you up, you can deflate the bag and prepare to board the boat (Photo 5). It is difficult to board a boat with a lift bag in tow, so roll the deflated bag and place it in a BC pocket or, safer yet, reattach it and the reel to your BC. 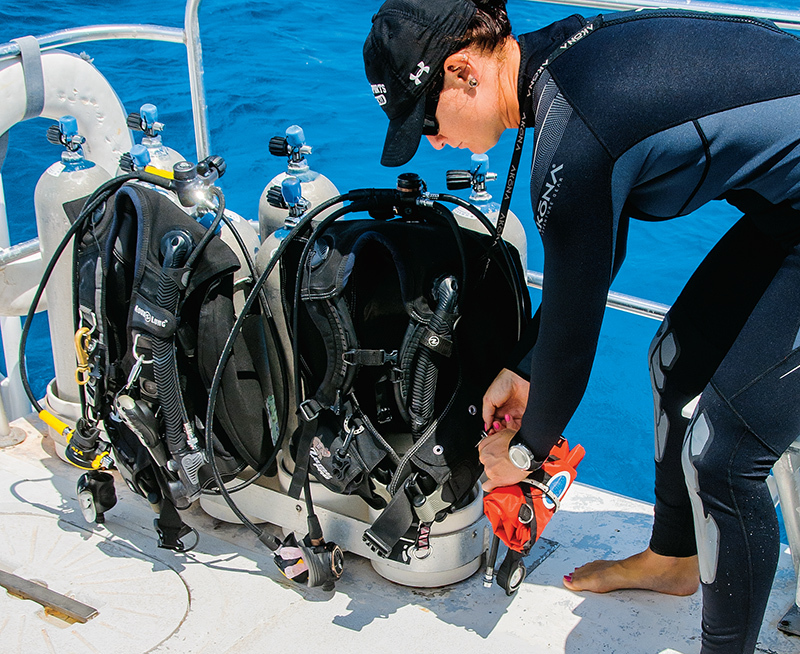 Performing a safety stop in blue water provides exciting opportunities that many divers never get to experience, but the absence of references can be disorienting. Using a lift bag as an aid can solve that problem and make your blue water safety stop more enjoyable.